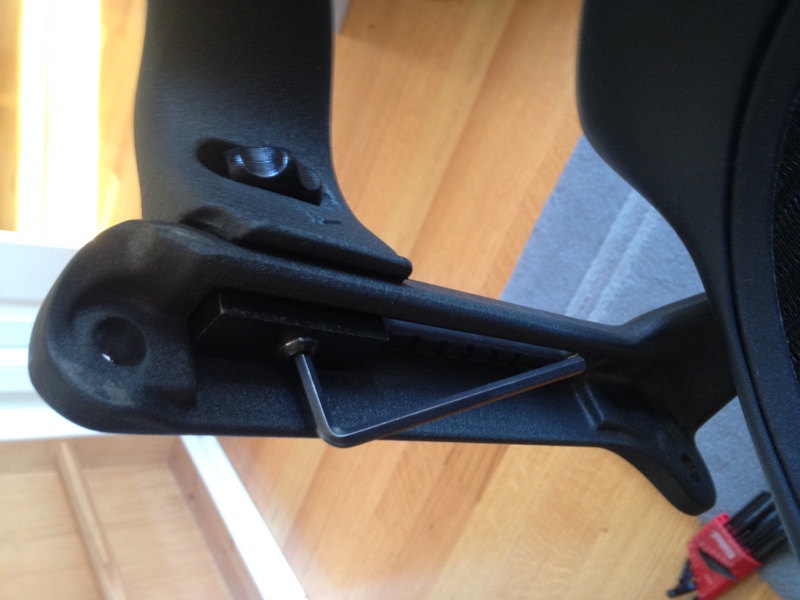 www.thehuangs.com » Aeron Chair Arm rests keep falling – Fix it! 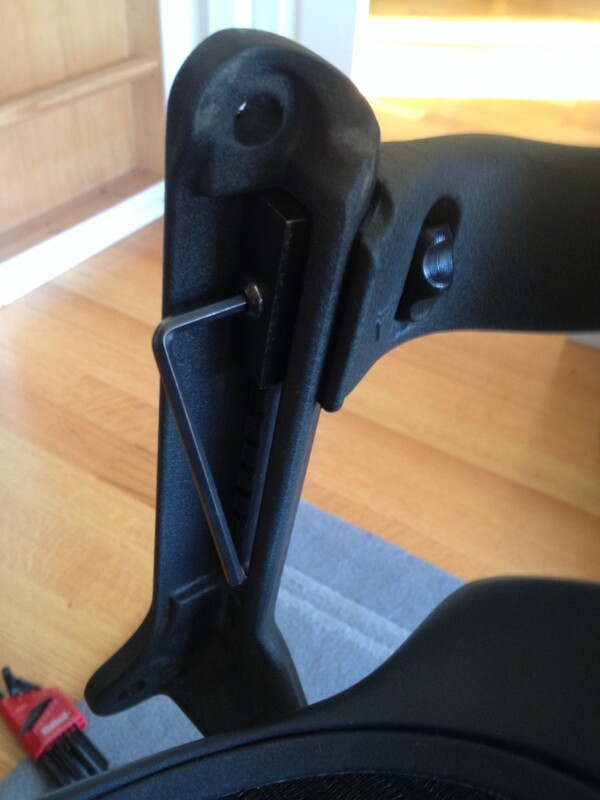 Aeron Chair Arm rests keep falling – Fix it! The past year my Aeron chair has been bothering me because the armrest will not stay in position. I search all over the web for a solution but it seems that Aeron has switched to a new system and mine is not really supported anymore. I have a knob that you turn to lock and unlock the armrest height. The newer models have a lever that you flip, similar to the quick release on the wheel of bikes. 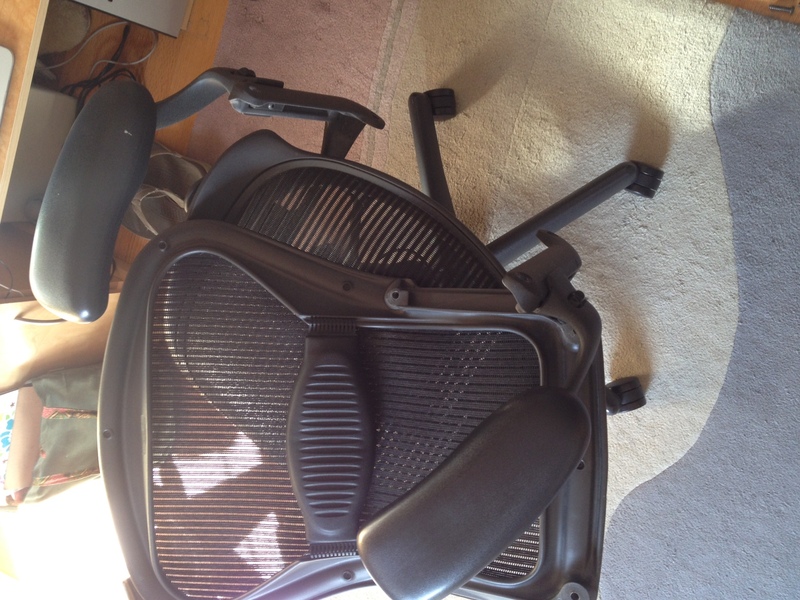 I finally figured I had nothing to lose so I decide to take apart my Aeron to see if I could fix it myself. As it turn out, it was a super easy fix. The securing mechanism for the arms just needed to be tightened! Why didn’t anyone mention this on all the websites I explored? Here’s a quick and easy step by step. First, remove the back of the Aeron chair. There are 4 screws securing the backrest and they are easy enough to remove using an allen wrench. Here’s what my chair looked like after the screws were gone and the backrest lifted off. After 4 screws are removed, the back comes off easily. If you look at the arm rest risers, the part that was covered by the backrest reveals a screw used to tighten the assembly. The reason the arm rests won’t stay up is because the assembly has gotten loose. All you have to do is tighten the assembly with the thumbwheel. You’ll notice that even with the thumbwheel tight, there is still some play by the metal plates secured by the hex screw. Use a wrench to tighten this bolt until it is snug. Don’t go crazy or you’ll not be able to operate the thumbwheel afterwards! Here’s a photo of the screw to tighten. Well, that’s all there is to it! After you’ve tightened the screw, just put the backrest back on (4 screws) and enjoy your chair with arm rests that actually stay at the height you put it. I can’t believe how easy it was and how hard it was to find any useful information on the web! I hope this little post will help someone who has similar issues with their older Aeron chair. Awesome, thanks. You need a torx wrench for mine, but I have the same problem. Hi I also have the same issue with the loose armrest. Do you know what size the screw was, or what size and type wrench you used to tighten this? (That armrest screw in the last picture). You know, I didn’t take note of the size. I have a set of hex wrenches and I just found the one that fit. I guess I should have taken note of that. Sorry to be of no help there. If I get a chance soon, I’ll try and take another look. John, thanks for adding the specifics. I had been meaning to add that info but my “ToDo’s” just got away from me. Interesting Chris. And here I was thinking that the new latch system would be a better solution. I guess the grass is always greener….hope springs eternal..and all that stuff. Richard, It looks like one of my blog visitors has provided the information that you were asking about. “the hex wrench that worked was a 3/16? and tightening the armrest itself required a T25 Torx head”. Fantastic directions. Worked like a charm. I could kiss you! Thanks so much. I just wanted to thank you for posting these instructions. This has been a long time problem with my chair and I was so frustrated about not finding answers on how to fix it. So easy! Hey, this page is the gift that keeps on giving. I just fixed my chair this weekend. By some miracle my drill bit set had one Torx bit — a 25! Thanks much for the instructions. I love it when things just work out. I’m glad it was useful for you. 3/16″ Allen worked for me, but the screw inside took a T27 Torx, not T25. The ‘new’ lever/latching mechanism is worse than the knob. My chair has never been satisfactorily firm wrt the armrest height adjustments. It will hold the height ok, but the thing has so much lateral slop that it’s irritating. I’ve been meaning to take it apart and see if that’s fixable. Anyone else have/fix this condition with the newer mechanism? Thanks so much for posting this. I cranked mine tight. I don’t plan on adjusting it. As long as it stops slipping and I never have to adjust it again, I’m so happy! On the lever/latch system you need to put a penny and use a butter knife to hold the bolt to tighten or loosen where the lever is. On the left side it is reverse thread and right arm is normal thread. The left side was loose on mine and I actually overtightened it to where it wouldn’t move up or down so I had to painstakeningly loosen and test. I have the opposite problem. My arm rests are stuck. I can turn the wheel a few turns in either direction before it cannot be turned any further. In any case, the arm rest does not move at all. How do I fix this? Figured out the problem 2 minutes after posting my question! Sorry about that! Thanks so much. Our chairs were brought in 1999 and have since went out of warranty. They fixed a couple broken issues for free. But this arm problem has occurred on several chairs. I just spent the morning correcting Arm height complaints and have also issued an order that these chairs can no longer be “borrowed”. Glad I heard your instructions and some others’ comments and assembled tools beforehand. Thanks a million! I have been dealing with this issue for quite awhile. This worked like a charm, I really appreciate it. BTW – I discovered a place called Beverly Hills Chairs that has a lot of great Aeron parts and deals. If you need replacement bits, look them up. This worked perfectly! My chair is back in great working order. A note for my chair, while they were all Torx screws, they were of a size and a pattern that I was able to work all of them with regular fractional allen wrenches. Also, keep in mind that the wheel may work itself out as you work the screw. For mine, I was tight enough on the screw, but the arm kept falling. Spun the wheel back and it retains perfectly. Ah, great to hear you are back in action. I am surprised by the number of folks that find this particular post of my personal blog. I don’t blog as much anymore, but these older posts are still useful. I’m glad it helped. thank you for this, saved me a lot of hassle. t30 and t27 were what i needed to fix mine. A solution, thank you for posting, worked perfectly! I thought my chair needed new arm, but thanks to your post, I’m now sitting ergonomically correct, thank you! Thank you! This has been vexing me for 18 years. You’re my new favorite superhero! THANK YOU!!!!!!! This definitely worked and was really easy! Thanks for posting this, you helped me fix this exact problem on my chair really easily! I walked out of my apartment complex and the complex next door someone had left an Aeron chair on the sidewalk with a FREE sign on it! I grabbed it and its MINT except this “loose arm” issue! At work so cant try the fix but it looks like this might be what I need to do! Awesome! These chairs are great and still get $350-500 used. You got a great find there regardless of whether or not the arm was falling. Thanks for posting! I did “go crazy” and tightened it down as hard as I could. Expect the arms will stay up for a long time. No desire to change position. Thanks! ARRRRRGHHH! 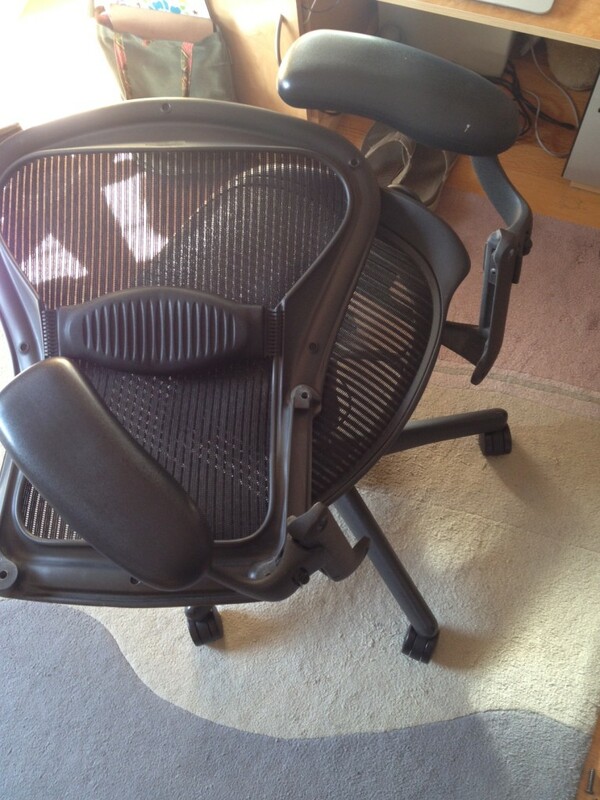 I fight with my Aeron chair it seems like every time I stand up or sit down over this. I’ve probably lost weeks worth of productivity screwing with the arms on the chair that’s been in my office for 12 years now. The hex drivers are coming out today, and I can sense the fear in the chair as I sit in it right now. No mercy. They are getting torqued down in the position I want. I might even put a lock washer in there. After 6 years of fighting my chair’s slipping armrest, I finally searched for a fix and found this. Took 5 minutes. I didn’t have a torx handy so I used a small flathead driver. Worked fine. Thanks so much. Mine did this for years !, I tried blocking them with card and all sorts but nothing worked. Was persuaded i needed a new mechanism, saw this and five minutes later, all is perfect. Thank you so much !!! Awesome! Thanks for posting this! Has driven me nuts soo many times over the last 14 yrs! Another big thank you for this guide. I took the back off my Aeron, then found I could use a small allen key to tighten the armrests, even though they used torx screws (thanks to Alex for first noticing this).